Click once or twice on the images for full-size picture. Christ Church Greyfriars, also known as Christ Church Newgate Street, stands at the corner of Newgate Street and King Edward Street, on the north side of St Paul’s Cathedral in the City of London. It was first established in the thirteenth century as the church of the Franciscan friary of Greyfriars. After the dissolution of the monasteries by Henry VIII in 1538, the church became a parish church serving the City. The area covered by the other buildings of the friary is today largely occupied by the Bank of America Merrill Lynch Financial Centre, beneath which some fragments of the ancient foundations have been preserved. 1. Outline plan of Greyfriars, from The Grey Friars of London by Charles Kingsford, Aberdeen University Press, 1915. Following its destruction in the Great Fire of London of 1666, Christ Church was rebuilt to the designs of Sir Christopher Wren. 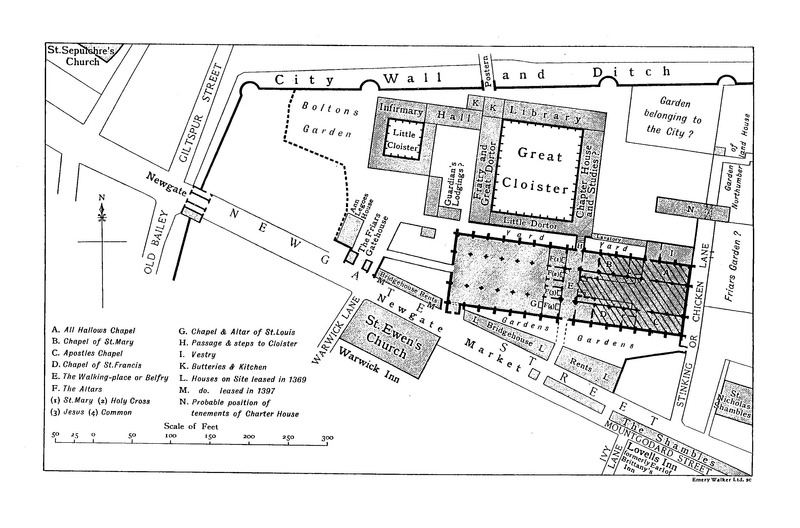 In the above plan, the footprint of Wren’s church is shown hatched. The interior was gutted by fire in the Second World War, with only the tower and outer walls only remaining intact. Large sections of these walls were demolished in 1973 for road-widening. In 2001 the footprint of the church was reinstated and low walls were built to mark the missing fabric. The surviving ruins are now a public garden. 2. The church of the friary of Greyfriars, destroyed in the Great Fire of 1666, looking east. The City wall is clearly depicted at the bottom of the picture, with Newgate Street on the right side. Wren’s church occupies only the site of the choir of the medieval church, beyond the spire. Franciscan friars first settled on a site close to the City wall in 1225, on land granted by John Iwyn, a rich mercer. Their first church was built using funds given by Sir William Joyner, Lord Mayor of London in 1239, but it was soon replaced by a bigger building, begun in 1306 and consecrated in 1326. 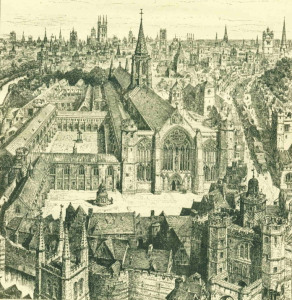 The new church, built in the gothic style, was the second largest in size and importance in medieval London after Old St Paul’s, measuring 300 feet (91 m) long and 89 feet (27 m) wide, and had at least eleven altars. It was built partly through the beneficence of Marguerite of France, second wife of King Edward I. She was buried at the church, as were the remains of three other queens – Isabella, widow of Edward II; the heart of Eleanor of Provence, wife of Henry III, which is said to have been interred beneath the altar; and Joan de la Tour, Queen of Scotland and daughter of Edward II. London’s citizenry was said to have aspired to be connected with the church, and many other illustrious people were interred there. A figure widely known from medieval history, Sir Thomas Malory, the chronicler of King Arthur, was interred near the south-west corner of the medieval church. Other burials of the famous or the notorious included Isabella, Lady de Coucy, eldest daughter of Edward III; Margaret, Duchess of Norfolk, granddaughter of Edward I; the prophetess Elizabeth Barton, the ‘Mad Maid of Kent’; the celebrated beauty and socialite Venetia Stanley; courtier, diplomat and natural philosopher Sir Kenelm Digby; and theologian Richard Baxter. The friary was dissolved in 1538 during the English Reformation. It had included a university and a library, founded in 1429 by Richard Whittington, Lord Mayor of London, and is said to have equalled Oxford in importance and status at the time. The church and its fittings suffered heavy damage during the time of the dissolution. Tombs disappeared, sold for their marble and other valuable materials, and monuments were defaced. In 1546 Henry VIII gave the priory and its church, along with the churches of St Nicholas Shambles and St Ewin, Newgate Market, to the City Corporation. A new parish of Christ Church was created, incorporating those of St Nicholas and St Ewin, and part of that of St Sepulchre. The old priory buildings were later used to house Christ’s Hospital School, founded in 1552 by Edward VI, and the church became its pupils’ principal place of worship. 3. 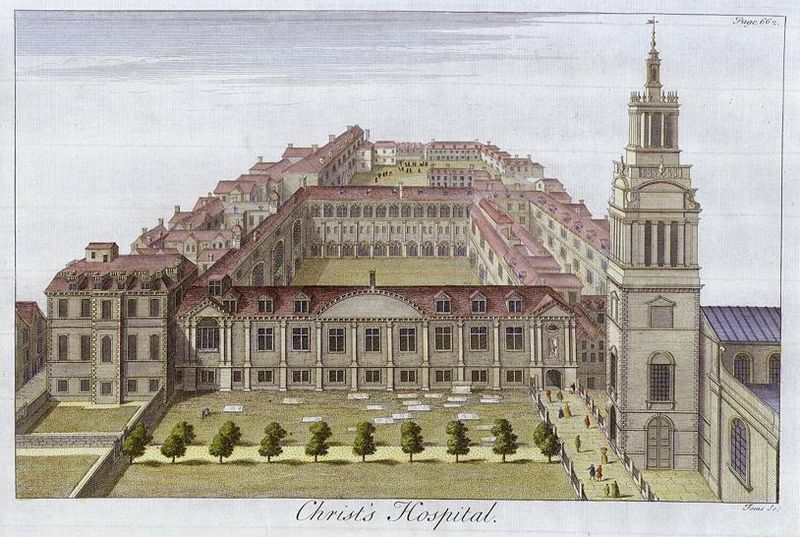 Christ’s Hospital School in 1770. The medieval church was destroyed in the Great Fire of London in 1666. Reconstruction was assigned to Wren, who oversaw a decades-long programme that rebuilt St. Paul’s Cathedral and approximately 50 other parish churches in the fire-devastated area. The parish was united with that of St Leonard, Foster Lane, which was not rebuilt. There appears to have been some debate about the form the new Christ Church should take. A surviving unused design shows a structure considerably larger than what was eventually built. Parishioners raised £1,000 to begin work on the design that in the end was selected. To save time and money, the foundations of the gothic church were partially re-used. Wren’s building is less than half the length of its predecessor, with its tower being built at the former crossing and its nave on the site of the choir. Significantly however, in basing the new church on the earlier foundations, he preserved the ground plan of the medieval church – the dimensions of its six bays and the setting-out of the columns are precisely as they were in the medieval church. The new church and tower – not yet with its steeple – were completed in 1687, at a total cost of £11,778 9s. shillings 7¼d. Occupying only the eastern part of the site of its predecessor, Wren’s building measured 114 feet (35 m) long and 81 feet (25 m) wide, with the western part of the medieval site becoming its churchyard. The tower, rising from the west end of the church, had a simple round-arched main entrance and, above, windows decorated with neoclassical pediments. Large carved pineapples, symbols of welcome, graced the four roof corners of the main church structure. Unique among the Wren churches, the east and west walls had buttresses. The steeple, standing about 160 feet (49 m) tall, was finished in 1704 at an additional cost of £1,963, 8s. 3½ d. It has three diminishing storeys, square in plan, the middle one with a freestanding Ionic colonnade. Sir Nikolaus Pevsner, the celebrated chronicler of England’s architecture, commented that it is one of the most splendid in London, and that it could be called a square version of that at St Mary-le-Bow. The interior was divided into nave and aisles by Corinthian columns, whose square-section bases were raised to gallery level, and innovation introduced here by Wren to make a more satisfactory junction between columns and gallery. The aisles had flat ceilings, while the nave ceiling had a shallow cross-vault, the only example of this type in Wren’s basilica-style churches, and perhaps a reminder of its medieval predecessor. The north and south walls had large round-arched windows of clear glass, which allowed for a brightly lit interior. 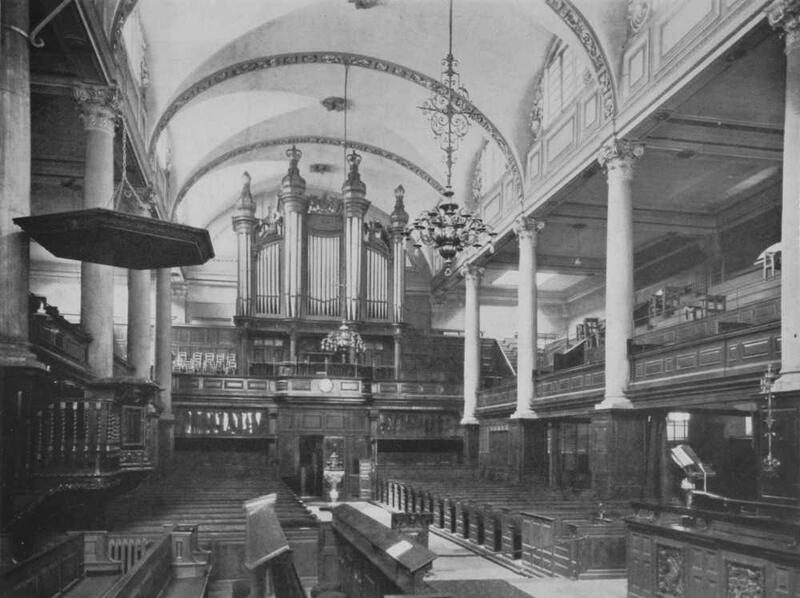 The east end had trinity windows, a large wooden altar screen and a carved hexagonal pulpit, reached by stairs. There was elaborate carved wainscoting. A pavement of reddish brown and grey marble to the west of the altar rails was said to date from the original gothic church. Steep galleries stood over the north and south aisles, built at special request of the officers of Christ’s Hospital as seating for the school’s students. Pews were said to have been made from the timbers of a wrecked Spanish galleon. The organ, on the west wall over the main nave door, was built by Renatus Harris in 1690, according to a pre-war guide to the church. 4. 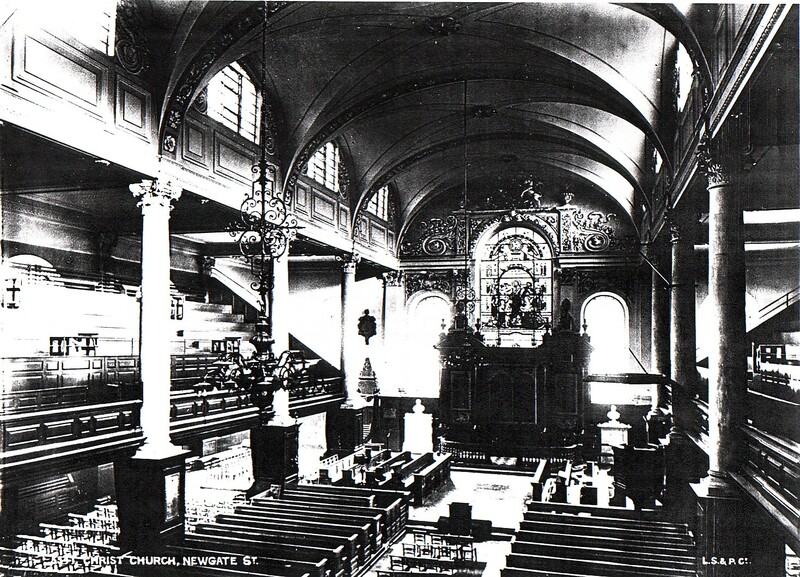 The interior of Christ Church before WW2, looking east. Note the groin-vaulted ceiling, Wren’s only ceiling of this type in his basilica-style churches. It is undoubtedly one of the reminders of the earlier medieval church, destroyed in 1666. The plan of his church precisely follows the plan of the medieval church, but is less than half its length and occupies only the choir of the earlier church. 5. This picture of the former interior also clearly shows the groin vaulting and gives an idea of the unusually wide nave, resulting from Wren basing his plan on that of the medieval church. 6. The interior, looking towards the organ gallery over the main entrance. In the course of the church’s history, significant modifications were made. In 1760, a vestry house was built against the walls at the church’s south-west corner. At some point, rooms were enclosed in the north and south aisles beneath the galleries. Stained glass depicting Jesus with the children was installed in the centre trinity window to replace the original clear glass. Christ’s Hospital School continued to occupy the ancient friary site until 1902, when it moved to Horsham. Its buildings were demolished, making way for new premises for the General Post Office, whose King Edward Building was completed in 1909..
7. Christ’s Hospital in 1896. On the left is the former Great Hall, by John Shaw, built in 1829. 8. This photograph of Christ Church was taken in 1904 and brings out the elegant geometry of the diminishing stages of the tower. The cleared site in the foreground and on the left indicate that the buildings of Christ’s Hospital have been demolished in preparation for the new GPO premises. 9. 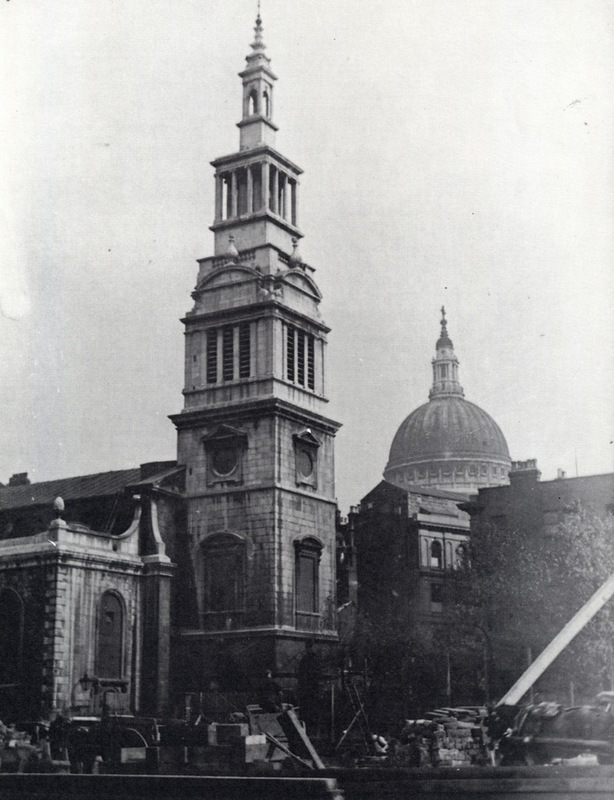 This picture, probably contemporaneous with the one above, shows how Wren considered the squareness of the tower of Christ Church in relation to the dome of St Paul’s. 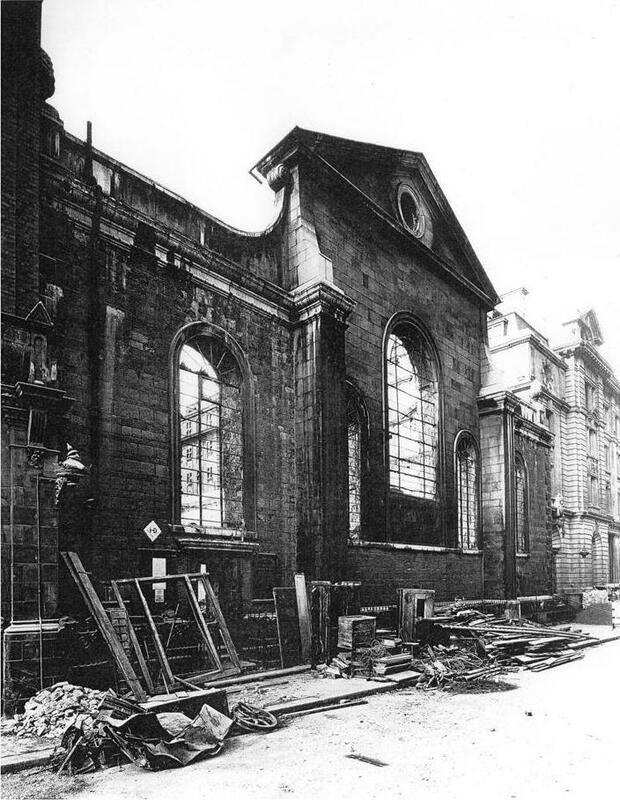 The church was severely damaged in the Blitz. On the night of 29th December 1940, during one of the Second World War’s fiercest air raids on London, an incendiary bomb struck the roof and tore into the nave. The woodwork of the church soon created an inferno. 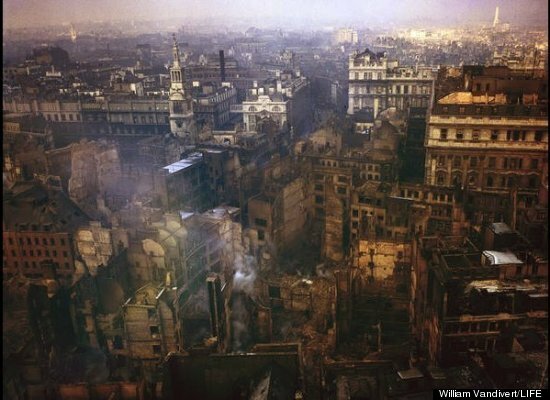 Much of the surrounding neighbourhood was also set alight by incendiaries – a total of eight Wren churches burned that night. Fire-fighting resources were desperately stretched, and the church could not be saved. Its roof and vaulting collapsed into the nave; the tower and four main walls, built of stone, remained standing but were smoke-scarred and weakened. 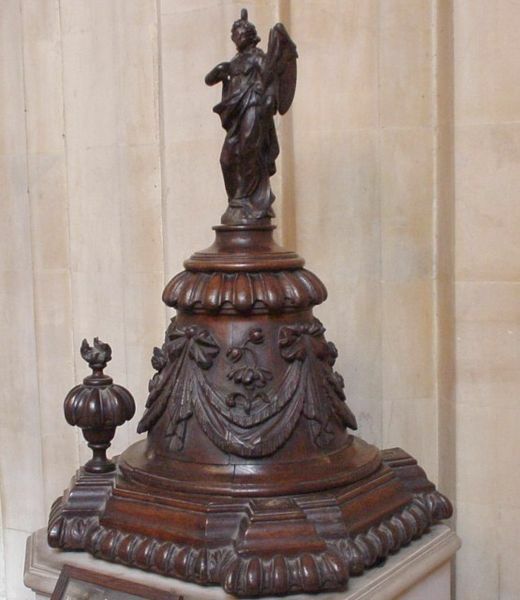 The only fitting known to have been saved from Christ Church was the cover of the finely carved wooden font, topped by a carved angel. It was recovered by an unknown postman who ran inside as the flames raged. Today it can be seen in the porch of St Sepulchre-without-Newgate. 10. 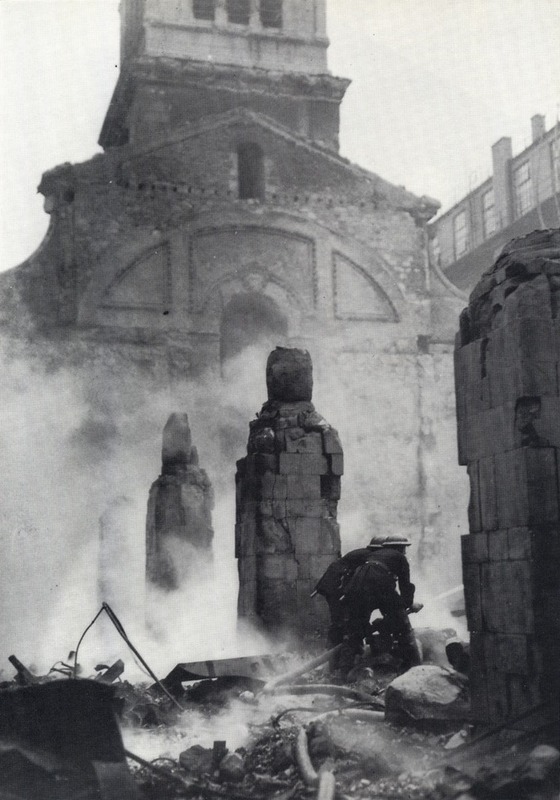 Two firemen hosing down smouldering rubble in the nave of Christ Church on the day following the fire. 11. 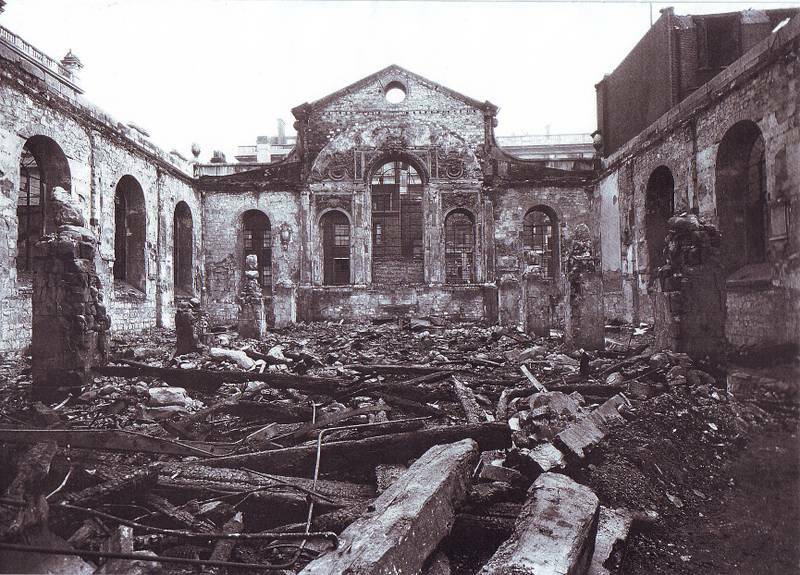 Christ Church after the fire of 29 December 1940, looking east. 12. 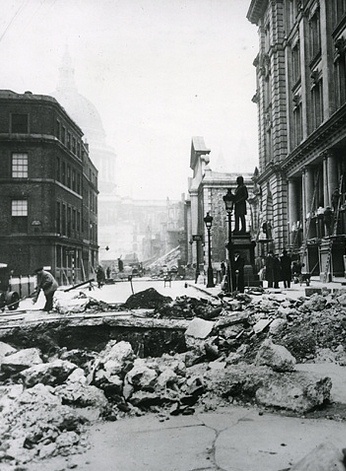 This historic photo looks north from St Paul’s across Paternoster Square, taken soon after 29 December 1940. In the middle distance the tower of Christ Church can be seen, and just to its right is the shell of the nave, now the location of the proposed Citizens’ Memorial. 13. Christ Church font cover, saved by an unknown postman, and now in St Sepulchre-without-Newgate. Image 4 depicts where it had formerly stood, in the main aisle of the nave. 14. This picture of the east wall of Christ Church on King Edward Street was taken not long after Images 11 and 12 above. 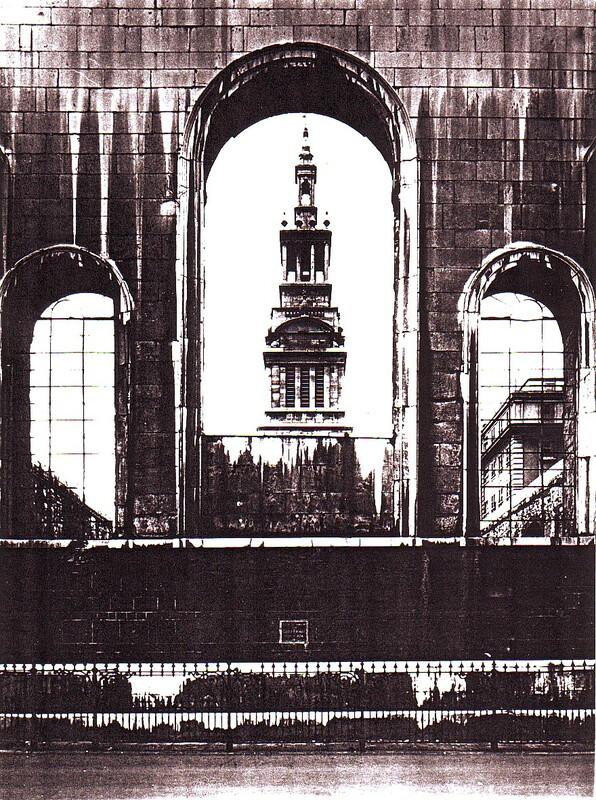 Despite the wartime detritus left on the pavement, it clearly conveys Wren’s strongly-modelled and dignified classical composition, which until its demolition by the City in 1973 made a significant contribution to the streetscape – it was a facade which was intended to be seen, unlike the north and south walls, which were thought likely to be hemmed-in by neighbouring buildings and were therefore finished in undressed stonework. Note that the church is abutted by the building on the left, resulting in the window of the adjoining bay having been blocked up. Note also the prominent buttresses, the pineapple vases on the corners, and the doorway under the left window, raising the question of whether this was an original feature. 15. A wartime view of King Edward Street looking south, probably also contemporaneous with Images 11 and 12. A high-explosive bomb has left a large crater in the middle of the street. To the left, St Paul’s is visible through the haze. To the right of centre is the east end of Christ Church, roofless. Silhouetted against the church is the statue of Rowland Hill, behind which on the right is the GPO Head Office. 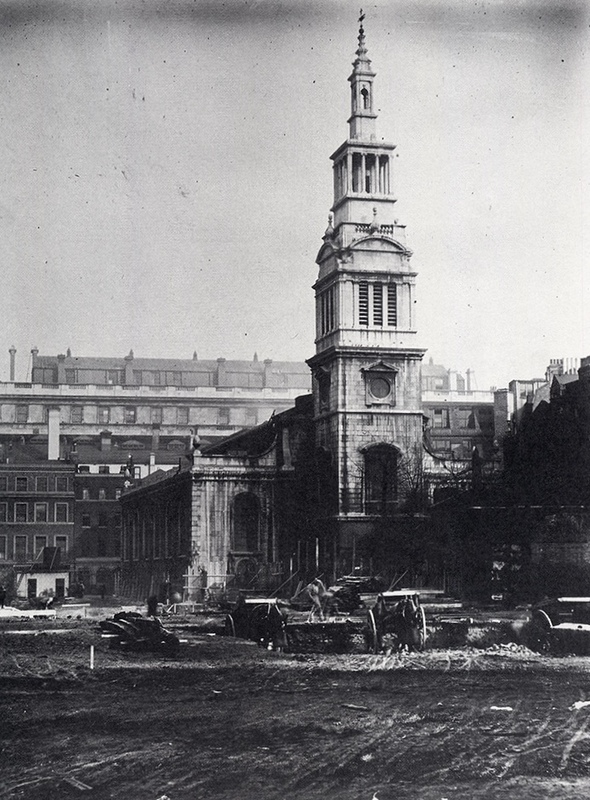 In 1949, in a reorganisation of Church of England parishes in London, the authorities decided not to rebuild Christ Church. The remains of the church were designated a Grade I listed building in 1950. In 1954, the Christ Church parish was merged with that of the nearby St Sepulchre-without-Newgate. The steeple, still standing after the wartime damage, was dismantled in 1960 and reconstructed using modern construction methods. The twelve urns which had surmounted the entablature above the Ionic columns in its middle storey, and which had been taken down in 1814, were restored, through a private benefaction, with fibreglass replicas. 16. The steeple of Christ Church seen from King Edward Street, through the east window of the church. A photograph taken after the reconstruction of the tower in 1960. This view was created as a result of the destruction of the interior during WW2, and existed until the demolition of the east wall itself in 1973. 17. The environs of Christ Church from the air in the late 1940’s. The church is just to the right of the dome of St Paul’s. 18. ‘Christ Church, Newgate Street’ by John Piper. Oil on canvas, painted in 1941. 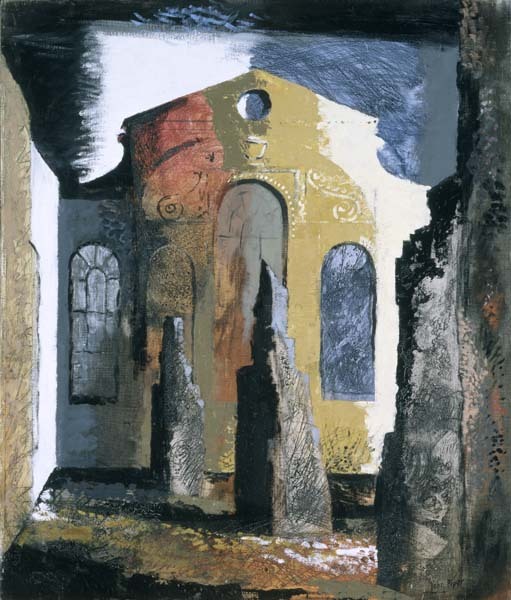 The destroyed nave of the church, looking east – compare with the drawing by Peter Shepheard, Image 8 in the description text. 19. 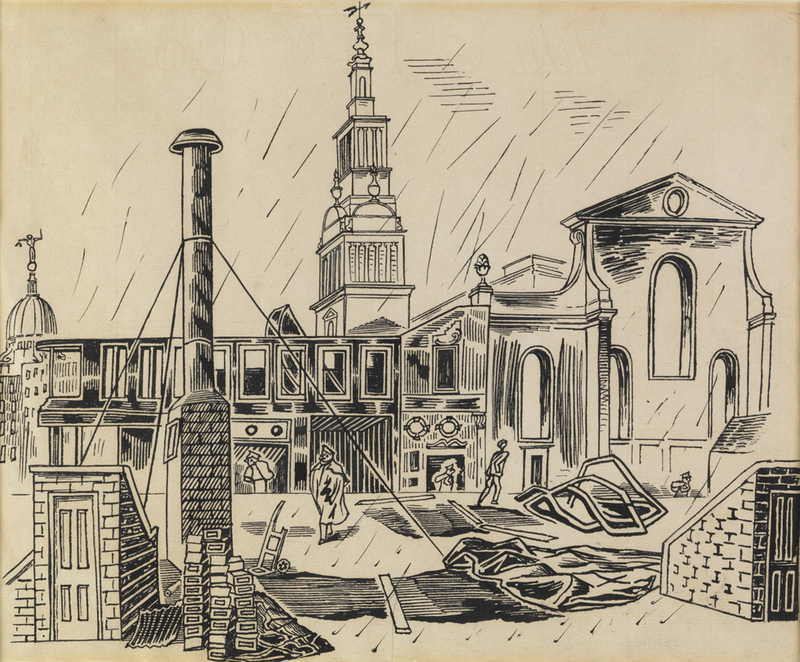 ‘Christchurch and Greyfriars’ by Edward Bawden. Drawing made in 1948. The artist succeeds in finding poetic touches on a grey, rainy day in post-war King Edward Street as postmen go about their duties. 20. 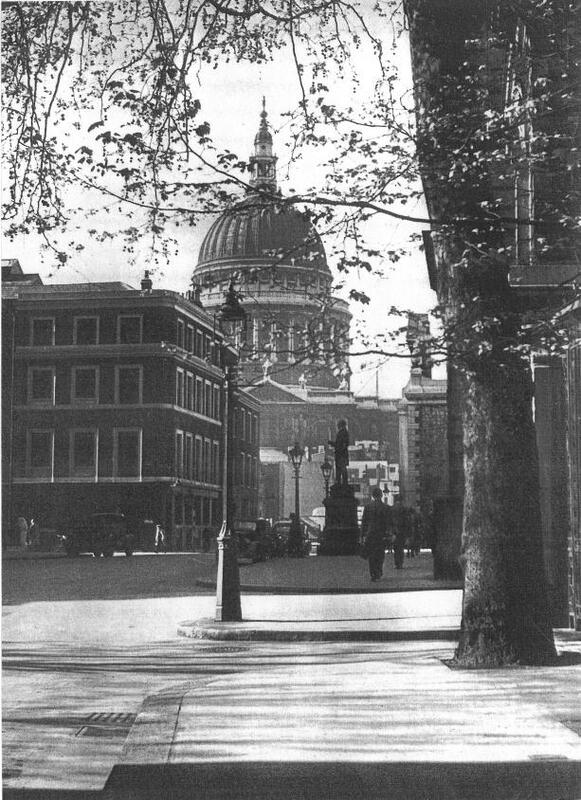 This photo of King Edward Street looking south towards St Paul’s was published in 1956. Compare with Image 15 in the sequence, which was taken from the middle of the road. The east end of Christ Church, with the pediment above its east wall in side view, is seen between the statue of Rowland Hill and the GPO Head Office to the right, and is still part of the streetscape. 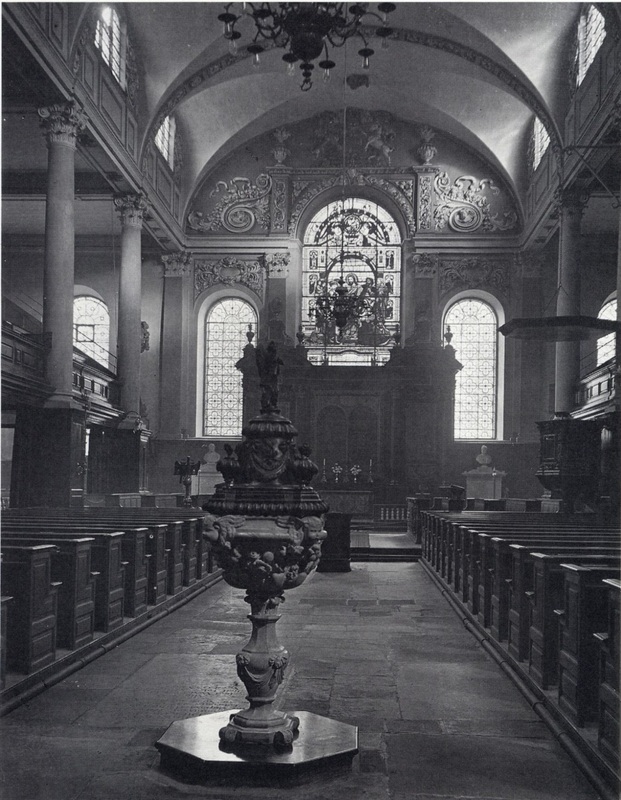 The east wall of the church was a strong classical design, as other photos show, and was undoubtedly intended by Wren to be seen in conjunction with St Paul’s. The fortunes of the Christ Church site after the 1960’s have largely been dictated by the vagaries of planning decisions. In 1973 the surviving east wall, much of the south wall and part of the north wall were shamefully demolished to make way for a widening of King Edward Street and the access to it from Newgate Street. This meant that, until 2001, traffic encroached the church site to the extent of actually passing over its foundations at its south-east corner. In 1981, neo-Georgian brick offices were constructed against the south-west corner of the ruins, in imitation of the 1760 vestry house that had stood there. In 1989, the former nave area became a public garden. In 2002, the financial firm Merrill Lynch completed its new European headquarters on the adjoining site to the north and the west, largely occupied previously by premises of the General Post Office, and originally the site of the Greyfriars friary. In connection with a Section 106 planning agreement included in the project, the Christ Church site underwent a major renovation and some archaeological investigation in the former nave. King Edward Street was returned approximately to its former alignment, and the footprint of the church, as it had existed prior to the demolition of large sections of its external walls, was reinstated. However the original walls were not reconstructed, and instead low stone walls, one metre in height, were built to mark their position. King Edward Street being now wider than previously, its pavement was re-aligned through the church itself, an unusual situation resulting in pedestrians traversing the site where the altar had formerly stood. The churchyard was renovated and its metal railings restored. The church tower initially functioned as commercial space, but in 2006 work was completed to convert the tower and steeple into a residential apartment on ten levels. It was then sold by the City authorities into the private property market. The nave area continues to be used as a garden. 21. This wartime photo has been retouched to remove the detritus left by bombing in order to show how the fabric would have looked today if the demolition had not taken place. The Citizens’ Memorial aims to reinstate the missing walls, modified only by the addition of arched openings under the windows of the north and south walls in order to retain the existing pedestrian route along King Edward Street, which is nowadays taken through the church site instead of being outside the east wall, as in the photo. 22. A view today overlooking Paternoster Square from the dome of St Paul’s. The block right of centre is the London Stock Exchange, beyond which, across Newgate Street, is Christ Church. At the extreme right is King Edward Street. Queen’s Head Passage, at lower right, is aligned on the north-south axis through the Cathedral and leads directly on to King Edward Street. 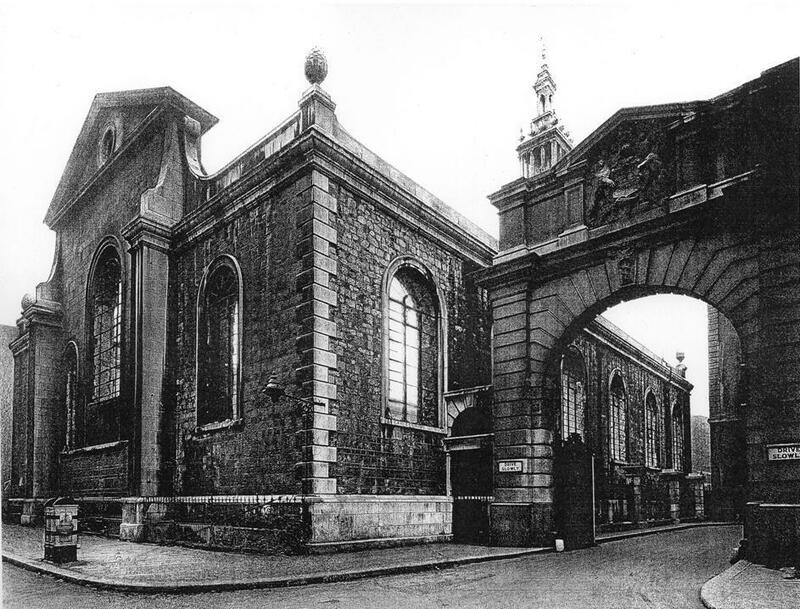 The rebuilt east end of the church, which would become the focus of the Citizens’ Memorial, would stand at the left side of King Edward Street and would thus be seen in the vista through Queen’s Head Passage. This would create a direct visual and pedestrian link with the building in London most indelibly associated with the Blitz and the Second World War. Please share your ideas about the Citizens’ Memorial proposal by leaving a comment or endorsement – just click on ‘Comments’ on the link below and go to ‘Leave a Reply’. This entry was written by thecitizensmemorial, posted on May 19, 2012 at 6:08 pm, filed under Uncategorized. Bookmark the permalink. Follow any comments here with the RSS feed for this post. Post a comment or leave a trackback: Trackback URL. I found the website most interesting. Please keep me posted. I believe that the memorial to the Citizens’ lives lost during World War II is purposeful and meaningful. When I think of British lives’ lost in WW2 I perhaps only think of the soldiers and not the thousands of brave civilians that also lost their lives. I think it is the right time to complete such a project as relatives of the lost ones that are still alive today will not only be able to pass on stories of family lost in the War, there will be a physical monument to mark their important ancestry, thus keeping the memory alive. Also, it is incredible that part of the Christchurch building, along with many other beautiful old buildings are still standing despite the blitz and to restore Christchurch to its former glory would be yet another jewel in the City of London’s collection of amazing historical buildings. It would also create a space in the heart of London to commemorate the many Londoner’s lives that were lost. I really hope that the memorial goes ahead. A fascinating and instructive presentation for a very worthwhile project which would be a great contribution to the city of London. Good luck. 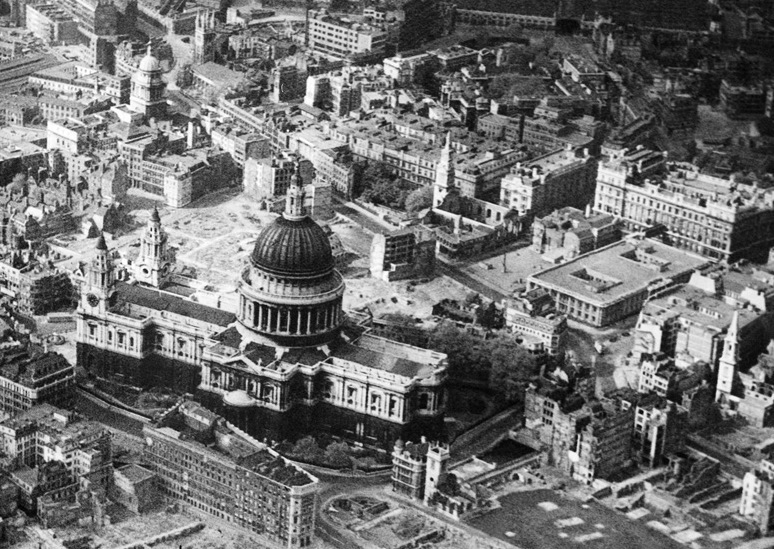 Many of London’s famous buildings were destroyed, in part, or completely, including, St. Paul’s Cathedral, Chelsea Old Church, the Chelsea Pensioners Hospital, The Temple “Free” Church, with its neighbor Wren’s St. Andrews, Guy’s Hospital, and seven other hospitals. To restore Christchurch and have a memorial is a very worthwhile project honoring all of those lost during WW2. Most young people have no idea of the actual horrors that ordinary citizens endured every day and should be educated about this. An interesting musical footnote for this section: from 1929 to 1932, Christ Church’s organist was the composer and performer William Lloyd Webber, father of Andrew and Julian. Felix Mendelssohn is said to have performed Bach’s A minor fugue in 1837. Records also show Samuel Wesley as having performed there. I love that there is a chain of historical sites with Christ Church Greyfriars one of the links. Also and close to my heart is the fact that visitors and pedestrians would have the unique experience of briefly passing through a sacred space as part of an everyday route since a pavement already passes through the site. I cannot see any good reason why this project should not be approved and go from strength to strength. I look forward to the day I can walk through, pause a moment in the gardens and think of all those who died, and then walk on into the wonderful City of London. Remembering as I go all those who bravely defended the city for us. This very worthwhile project has been meticulously researched, historically linked and well proposed. I totally agree that this would be a wonderful opportunity to pay tribute to all those who lost their lives, both civilians and soldiers. The proposed site and design would provide a fitting memorial. As someone who lives on the fringes of the city and spends much time walking and discovering the history of the city this project would be a welcome addition to commemorate those who gave their lives in WWII. At present the Christ Church, which is a historical treasure, is abandoned and is not treated with the dignity it deserves. Reviving the Church to its formal glory and creating a memorial will harmoniously blend the historical heritage to the modern adjacent buildings. It will complement the mix of modern and historical features in London. It will give a pause in time, a little heaven of peace and sacred space for people to relax and contemplate the selfless courage and sacrifices that the Londoners made, for the better of humanity today. It is a must. Good to read the background history of the remains of Christ Church and I wish you success with this worthwhile project. Was interested to see: “The friary was dissolved in 1538 during the English Reformation. It had included a university and a library, founded in 1429 by Richard Whittington, Lord Mayor of London, and is said to have equalled Oxford in importance and status at the time”. That Christs Hospital school was once part of Grey Friars further attests to the tradition of education connected with this site. Perhaps an important aspect of remembering citizens killed in WW2 could be the reinstatement of an education establishment that researches the effects of conflict on civilians and ways to protect civilians from the long term effects of the devastation caused by war. Education can be the best memorial and creates an enduring connection between the dead and the living. Thank you for the education provided so far. As a newbie to London (I only moved here in Feb) I have been taking the opportunity of seeking out the treasures of the city, both the well known and those that are hidden in plain site but with an amazing story. While it may be common knowledge in around the city that this was a Wren Church (though possibly not) I was only made aware when I read a friends copy of Barbican Life (spring 2014). My thoughts regarding this are mainly summed up by the phrase “Doh!” Is it me or are there many things that should and could happen in London, that are “no brainers” that still seem to take an awful lot longer than they do. Firstly, whether or not the church is used as a memorial for those lost, the church should be restored and maintained in its own right. Also there should of course be a memorial to those civilians lost in the war. The idea of putting the two together is both a practical and beautiful sentiment. I would be interested in understanding more what blocks (aside money which is always one) there are in the way of this, is it simply approval that is needed or are there legitimate concerns and consequences to the proposal. Also, and I may not have read the piece as carefully as I should, are there any time scales to this? It is mentioned that the proposal has the backing of a number of prominent individuals both from public and private areas of the business, government and COL. I’m unclear as to the impact of his endorsement, but could the Mayor be approached about the proposal to see if his backing would raise its profile? My final comment (for the moment) would be regarding funding, with the location of the site and the already established link to funding from the surrounding businesses this must be an obvious avenue to consider. It proximity to the banks would mean that a great many number of the people who would benefit and use it would be from this arena. However, consideration must be made regarding, however subtle, an advertising opportunity this becomes. It would I feel, be a great shame, if allocation was made for the all to often seen “This would not have been possible without the financial support of …..” If this is truly a monument for those who gave the ultimate sacrifice then I feel it is not to large a burden to ask those willing to contribute to forgo a permanent reminder of their good deed. Janine & Richard Rothwell. We live in France and while in London we heard about the Citizens’ Memorial project. We think it is an excellent idea to have a space dedicated to the memory of those ordinary Londoners who lost their lives during the war. The designer has produced an impressive scheme for creating an area where a partially restored ruin of a neglected Wren church would be the framework for an open space for reflection: a wonderful idea. This proposal is a very powerful one. I have walked round the site and can see that there is pressing need for some improvement, as although the garden is lovely now, it is very dominated by traffic noise and fumes. It would be far more effective as a sheltered haven from London traffic. The remains of the church are not shown to advantage in the current arrangement. 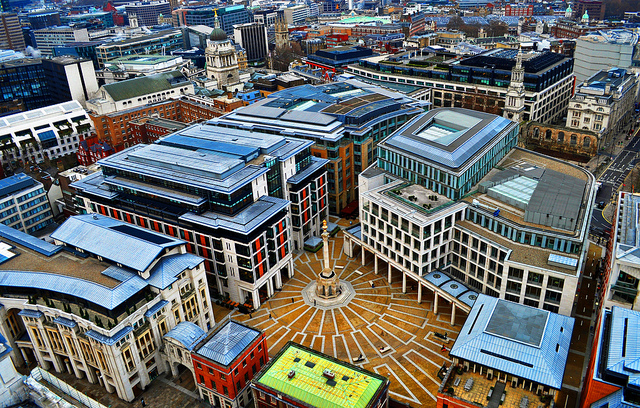 As one of many people who recognise the traditional role finance from wealthy institutions has played in making our cities beautiful, it would be very fitting for this project to be approved, so that the businesses that gain so much from their location in the City of London, could be offered such an inspirational way to give something of permanent value to all London citizens. I will look forward to hearing how this project moves forward in the coming months. London Remembers has found 39 memorials in London to civilians killed by acts of war, or terrorism. This diversity is great but the sheer quantity supports the claim that a single all-encompassing memorial is also needed. Here’s the London Remembers page showing all those memorials: http://bit.ly/10UXr6u (forgot this on previous comment). those, like Margaret, whose tombs were destroyed by theft, fire, war and whose resulting fragmented bones had the great indignity of having a busy road pass overhead. I would love to see a small museum in the immediate area detailing the history of the building, those who used the buildings and the history of the church. Margaret was a remarkable and formidable woman and she deserves better than to have had her grave desecrated and ruined again and again. Thank you so much for your positive comment. Please do share the website as you wish. At the moment the City has ‘parked’ the proposal while traffic and environmental studies are completed. I’ve had some correspondence with the City recently on this, and to express to them my displeasure that they don’t appreciate the history or the heritage opportunities of the site. You may like to know that a former correspondent at the Washington Post and resident in Washington DC, John Burgess, has written a novel set around the church, an article on the Wren churches and other research.